The Load King 403 DFP and 403 DFM folding gooseneck trailers boast a parallel link style power fold gooseneck, using hydraulic cylinders to raise and lower the trailer for fast and safe operation when a truck-mounted winch is not available. This folding design, much like E-Z fold is designed to eliminate binding. With an 80,000 lb. capacity in 8′ load concentration at 60 mph, this gooseneck trailer has a 106″ and 85″ swing clearance. 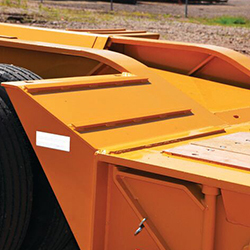 Available with a hydraulically-operated gooseneck (DFP) or mechanically-operated (DFM).